The group receiving cash from Polish state is “Independent Poland”: and extreme right-wing organisation, which, until very recently, declared on their Facebook page that its main aim is to “fight with leftists of all sorts, and prevent them from crawling all over.” In Poland, the group is publishing a magazine known for its virulently islamophobic covers (and content). In November 2017, the activists from “Independent Poland” held a book fair in Slough. The invited guests included Rafał Ziemkiewicz: author and journalist known for his outspoken islamophobic, antisemitic and sexist statements, and Leszek Żebrowski: a guy, who, despite of having a degree in economy, fancies himself a historian. He gained notoriety in his home country for his associations with extreme right, and claims that “judeo- communists” are trying to take over Poland. On posters advertising his events, he states that “the youth needs to know how the Jews are conducting their anti-Polish actions”. Needless to say, he is also not in favour of refugees, and is known for stating that “white people [in Europe] are afraid to walk the streets” due to the alleged islamification of Europe. What’s more, the event was attended by members of “OGNIWO”: a group which can’t be described by any other name than neo nazi. They brought with them banners celebrating Janusz Waluś: a polish white supremicist who is currently serving a life sentence in South Africa for the 1993 assassination of Chris Hani, General Secretary of the South African Communist Party and chief of staff of Umkhonto we Sizwe, the armed wing of the African National Congress (ANC). Despite of this, the book fair was co-funded by the Polish Embassy in London, who also offered its patronage over the event. Later the embassy issued a statement, explaining that both patronage and funding of the event was, well, a mistake. “The Embassy of the Republic of Poland would like to state that it does not support any kind of radical anti-Muslim or anti-migrant rhetoric. The event received backing in a good faith as a Polish community project, which was supposed to support reading in the Polish language and promote Polish history among Polish diaspora. (…) The Embassy is unable, however, to monitor or answer for all statements made by the guests invited by the organisers from the Polish diaspora”- the statement reads. The problem with this statement is that the embassy should have known who they give their money and backing to. In February 2017, it took over the patronage of another event organised by Independent Poland, also in Slough. This time it was a cross-country race organised in memory of so-called “cursed soldiers”: a term applied to a variety of Polish anti-communist resistance movement groups formed in the later stages of the WW2, who continued their armed struggle well into 1950s. These groups consisted of many nazi- collaborators and were also responsible for war crimes and atrocities, largely committed on Jewish and Orthodox Christian civilians. The race was supposed to end with speeches from Jacek Międlar: Polish hate preaching ex-priest, and, again, Leszek Żebrowski. After the based in Poland co-organizer group pulled out from the event, citing as a reason that Independent Poland is “openly advocating discrimination and violence”, the embassy also decided to cancel their patronage, but its logo stayed on the leaflets promoting the race. The event ended up to be rather unsuccessful, as Jacek Międlar was stopped at the UK border and denied entry to the country. Back in Poland, he claimed he was stopped by “Jewish Special Forces”, but in real World it is more likely is was UK Border Force. Later, Międlar was once again stopped at the UK border, this time when he was travelling to attend a Britain First event in Birmingham. 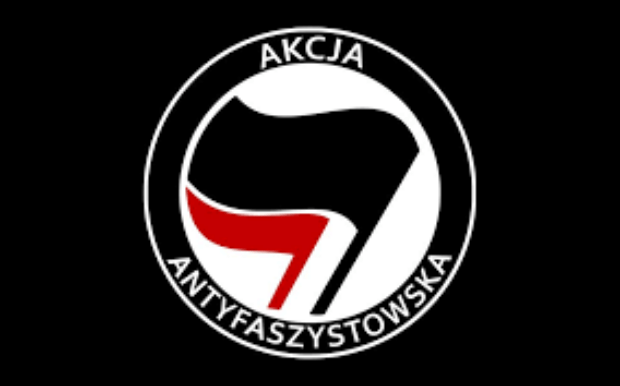 Prior to the racist book fair, the embassy was petitioned by Unite Against Fascism and Polish antifascist group Nie-Patrioci UK to cancel its support. Both were raising concerns regarding the embassy’s participation in a hate preaching event, both were ignored. It is then difficult to believe that Polish diplomats did not know what are they supporting. In any case, the embassy’s support of problematic Polish diaspora groups seems to go in line with the general Polish state policy of promoting far right ideologies and racism, not only in Poland but also abroad. For instance, last year polish Ministry of Foreign Affairs donated 150,000 PLN, or about £30,000, to Polish “patriotic rock” band Contra Mundum. The generous donation was supposed to fund the bands three-gig tour in the UK, however, according to Polish media, the tour never happened and the donation was simply defrauded by either the band or the supposed gig organiser. Polish state also routinely supports all sorts of far right events and promotes the “cursed soldiers” as national heroes. What’s more, considering that the leader of Polish ruling party Jaroslaw Kaczynski publicly accused muslim refugees of bringing “cholera, dysentery and parasites” to Europe, perhaps supporting a blatantly racist event isn’t anything Polish officials will think twice about: spreading far right propaganda seems to be the policy of current Polish government.